As we speak, at 04.17, Barack Obama is the new president of the United States. This may be old news by now, but I just woke up after an unplanned nap. 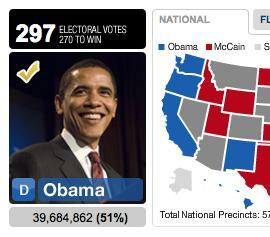 When I nodded off, in front of the telly, Obama was on 220 votes. (I’m on the sofa of some friends who had already nodded off before me!) It’s all very late for me. I managed to stay up to this unearthly hour by attending the CNN Election Night Party in Central London, in a converted church lit up by stars and stripes and serving three cocktails: the CNN Electini (Belvedere vodka martini shaken or stirred, garnished with blueberry and raspberry), the Donkey Dazzler (Bacardi, cranberry and pineapple juice shaken with fresh ginger and garnished with lime) and the Electric Elephant (Jack Daniel’s, lemon juice, syrup de gomme and angostura bitters, shaken and topped with soda). I had a few bottles of Samuel Adams beer instead, for fear of flaking out. It was quite a smart do – well outside of my comfort zone – and they were showing CNN, obviously, on a wall-sized screen. I rubbed shoulders with Ed Milliband, Harriett Harman, Trevor Phillips, Gurinda Chadha, Dianne Abbott, Josh Hartnett, James Purnell, Shami Chakrabati and others. The only downside to this party was the fact that it ended at 3am, when they started sweeping up around us, forcing the move to my friends’ house. Anyway, I just woke up and he had won. On Sky, which I’m watching, Irvine Welsh is an unlikely pundit, with a Panama hat on. I’ll get some sleep now, on this welcome sofa, but it’s looking like a done deal. McCain is conceding in Phoenix. Hooray. He’s being pretty gracious, actually.